I originally wrote this article in 2010 for Atomic Ballroom out in Southern California. Recently I have modified it to be appropriate for my blog. Bands provide a great service by playing for dancers. However for dancers who are newer or from a different area where live music is not as prevalent, they may not know the preferred etiquette for a dance with live music. Below is a list of etiquette on a night with a live band for newer dancers, as well a friendly reminder to more experienced dancers. This guide does not cover the situation of finding a live band and deciding to dance at a venue dancing is not advertised for. A detailed guide could be provided for that situation, but it is hoped that most people could use common sense to access if and how to dance at those venues is appropriate. Just like a concert, when a band is finished playing a song it is good etiquette to give the band a round of applause. (Cheering after a particularly good song is also appropriate as well!) Once in awhile dancers get excited about a good dance and while thanking their partner accidentally forget this. So even when you are excited try to keep this tip in mind. Sometimes before playing songs the bandleader will share a little bit of information about a song. While you may be eager to dance, if you are close to the band/on the dance floor try to keep your voice low to show respect for the person talking. In addition announcements are sometimes made that are relevant to all dancers on the floor such as car lights being left on to registration cutoff times for competitions. At venues that the band plays on the dance floor, dancers get a treat by having the ability to dance right up next to the band. However with privilege comes responsibility. Therefore when dancing up close, right next to the band, be extra cautious and maintain a reasonable distance so there is no possibility of accidentally colliding into any of the band members. If you are in a venue that the band uses a tip jar which is common practice in some areas like New Orleans, be extra cautious around that as well. If you see band members hanging out during their set breaks or after they are done playing, it is great etiquette to thank them for their performance. What I like to personally do is, if I hear a solo that I find particularly amazing during a dance I try to find that individual band member and thank them for it. When bands are playing at venues such as bars with no cover charge, often the deciding factor of if they get hired again is how much revenue the place collects by the end of the night. Or in some cases such as busking outdoors, the money the band makes for their performance is mainly based on how much they collect in tips. So when one goes out dance at places that don’t charge cover, it is considered good form to buy food or drinks from a venue and/or tip the band depending upon what type of venue or event you are at. 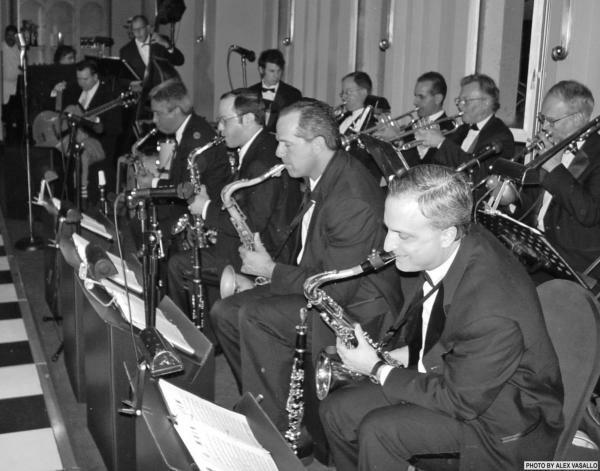 Like many of the professional dancers in the swing dance community, musicians that play for us often sink countless time and energy in their artistic endeavor. So try to keep this list in mind and everyone can have an amazing night. If there is any advice that you would give for dancers who are attending a live band please list that in the comments section, thanks! This entry was posted on November 25, 2012 by Apache. It was filed under Running a Scene and was tagged with Lindy Hop, live bands, Swing Dance. I agree totally. I am a performer (singer), and indeed a lot of work goes into the preparation and the actual performance. One of my pet hates is also the individuals who come up, while you are playing and ask if they can sing a song. Yes Yes Yes! you find there are a lot of rude people out there. Take the time to appreciate what the band has to offer. And Always smile, people wonder what you have been up to. These days, it’s the bands that are left to do the marketing. Any advice you can give to us on how to reach those dancers that would enjoy our segment of the swing music genre would be of enormous help.